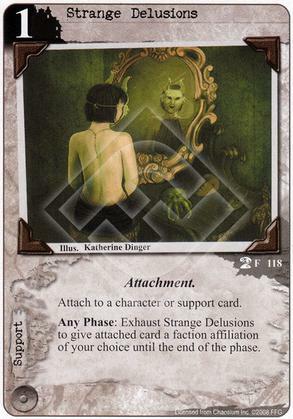 Can I use Strange delusions to change a card of a specific faction into neutral? First, it doesn't "change" the faction of a card. It just adds one. So if a card is Shub and you use Strange Delusions and grant it Miskatonic, the card is now both Shub and Miskatonic until the end of the Phase. Second, Neutral is not a faction, so you can't pick Neutral as your grant.